Established 1909 at Newark Public Library by Newark Librarian and Museum founding Director John Cotton Dana, original collection included Japanese prints, textiles and ceramics donated by Newark pharmacist. Moved into own building in 1920s funded with gift from retailer Louis Bamberger, later expanded into adjacent former YWCA and Ballantine House, built 1885 by son of founder of Ballantine brewery. Renovation in 1990 designed by architect Michael Graves integrated different structures into current building, now New Jersey's largest museum. ﻿Holdings comprise American art, decorative arts, contemporary art, and arts of Asia, Africa, the Americas, and ancient world. American art includes works by Hiram Powers, Thomas Cole, John Singer Sargent, Albert Bierstadt, Frederick Church, Childe Hassam, Mary Cassatt, Edward Hopper, Georgia O'Keeffe, Joseph Stella, Tony Smith and Frank Stella. Tibetan galleries considered among finest in world. Founded 1914, first institution in New Jersey designed as a museum, one of nation's first museums primarily engaged in collecting American art and among first dedicated to create a significant Native American art collection. Original collection based on donations from prominent Montclair residents, including gift of 36 paintings from William T. Evans, largest collector of American art up to World War I. Current holdings comprise over 12,000 paintings, prints, drawings, photographs, and sculpture dating from 18th century to present, with works of Asher B. Durand, John Singer Sargent, Edward Hopper, Georgia O’Keeffe, Andy Warhol, and Roy Lichtenstein, as well as younger emerging artists. Yard School of Art established 1924 provides range of courses for children and adults, also holds summer art camp..
Collection of over 40,000 objects. Fine arts collection includes paintings, sculptures, photography, works on paper, crafts, and mixed media art, majority comprised of 19th and 20th century European and American painting and sculpture with significant works by American landscape painters who worked in New Jersey, including Andrew Melrose, Thomas Moran and Charles Warren Eaton, along with modern and contemporary artists and regional New Jersey artists. Extensive costume and textile collection contains clothing and accessories for adults and children dating as early as mid 1700s and as recently as fashions designed by Pucci and House of Scaasi. Other holdings range from rocks and minerals to model trains, as well as one of country's largest collections of 19th century mechanical musical instruments, dolls, toys and machines. Bickford Theatre presents variety of plays, concerts, and other performances. 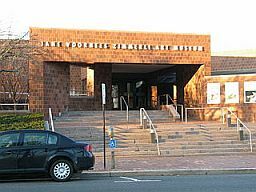 Flagship facility of ﻿﻿﻿﻿﻿Montclair U﻿niversity Art Galleries﻿﻿﻿﻿﻿﻿, features important works of sculptor George Segal, other holdings include modern and contemporary art by Richard Anuszkiewitz, Alexander Calder, Andy Warhol, Alberto Giacometti, Clarence Holbrook Carter, Andre Masson and Mayer William Schlesinger. Major gifts include Lida Hilton Print Collection and Lucy Lewis Collection of Contemporary Native American pottery. Site of famed furniture craftsman Gustav Stickley's early 20th century country estate. Collection includes many Stickley furnishings, several original to Log House, Stickley family home built in 1911, considered one of most significant landmarks of American Arts and Crafts movement and designated National Historic Landmark. Stickley and family lived at house from 1911 until forced sale in 1915 due to bankruptcy. Other holdings include textiles, pottery, metalwork, and archival materials. One of five museums around world dedicated to African art founded and maintained by the Society of African Missions (SMA), an international Roman Catholic missionary organization working in Africa founded by Frenchman Bishop Melchior de Marion Brésillac (1813-1859). Tenafly museum established 1980, permanent collections include sub-Saharan sculpture and painting, costumes, textiles and decorative arts, religion and folklore. Presents exhibitions of contemporary art. 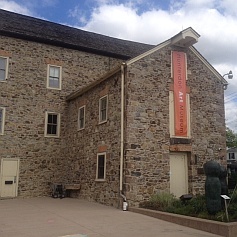 Ben Shahn Center for the Visual Arts named in memory of prominent New Jersey-based artist who was painter, photographer, printmaker, muralist, illustrator and graphic designer best-known for pursuing social, labor and political themes in 1930s and 1940s. Permanent collection includes some 3,400 objects ranging from Walt Disney animation cells to outdoor sculpture, contemporary prints, African and Oceanic art and holdings of over 400 limited-editions of artists' books. One of only five museums in US to exclusively display wildlife art. Established 1957 with bequest and collections of Hiram Blauvelt, philanthropist, conservationist and collector of wildlife art. Now operated by Blauvelt-Demarest Foundation, mission to promote cultural value of wildlife art and need for wildlife conservation. Features works of contemporary wildlife artists, built on foundation of Blauvelt’s early collection of works by Charles Livingston Bull, Carl Rungius and a complete Audubon Folio of extinct birds. Museum located in 1893 cedar shingle and turret carriage house. Focus on contemporary art exhibitions, classes and events. Artists include prominent national and international figures, as well as emerging artists from New Jersey and New York. Sponsors curated exhibitions in on-site galleries and at offsite locations and provides educational programs to under-served audiences, such as elderly, those with special needs and women and children from low-income families. Nonprofit supported by members, patrons and sponsors. On Kean University campus, features work of faculty and students in James Howe Gallery and Nancy Dryfoos Gallery. Other exhibitions integrate visual arts with various academic programs throughout the university. Shows in Karl and Helen Burger Gallery highlight cultural issues,often interdisciplinary in nature. Human Rights Institute Gallery highlights issues related to human rights around world. Established 1985 by Borough of North Plainfield with collection of cameras of late Benjamin Fleetwood and oil paintings of his wife, late Matilda Fleetwood. Now sponsored by Green Acres Commission of North Plainfield and Plainfield Foundation. Collection of over 800 cameras, illustrating 150-year evolution of camera design and examples of photographic processes which evolved during that period. Houses specialized reference library available to visiting camera collectors and historians. Museum located in Vermeule Community Center, an early 19th century mansion on eight-acre tract. Located on main campus of Rutgers near Old Queens main administrative building. Founded 1966 as Rutgers University Art Gallery to celebrate University’s bicentennial, gallery expanded in 1983 and renamed Jane Voorhees Zimmerli Art Museum in honor of mother of Ralph and Alan Voorhees, major benefactors for Museum’s expansion. Collection includes over 60,000 works of art, ranging from ancient to contemporary art. Permanent collection features holdings in 19th-century French art; Russian art from icons to avant-garde; Soviet nonconformist art from Dodge Collection; and 16,500 examples of American art, including notable prints. Also small groups of antiquities, old master paintings, Japanese art and original illustrations for children's books. Earliest American paintings in collection date to late eighteenth century when Rutgers founded 1766 as Queen’s College. Housed in a former stone grist mill on Raritan River built 1836, replaced original mill on site built in 1763 which supposedly ground wheat for General George Washington’s army during its encampment in Morristown. After sale in 1950s, local residents raised funds to restore and convert structure as museum. Features rotating exhibits, frequently of prominent local artists. Also sponsors wide range of classes in painting, drawing and design. Located on campus of Brookdale Community College. Features changing exhibitions and programs on art, science, nature and cultural history. Established 1963, permanent home built in 1974, entirely from private funds, on two-acre site on Brookdale Community College campus. Houses one of North America's largest collections of 18th and 19th century sewing clamps also known as "sewing birds," sewing clamps used to attach one end of a piece of cloth firmly to a table to enable a seamstress to hold sewing taut with one hand while stitching with other, commenced with 1980 bequest from Eugenie Bijur of some 400 sewing birds. Located on Princeton University main campus, formally established in 1882 along with founding of Department of Art and Archaeology, expanded with subsequent gifts from collections and purchases by faculty and alumni. Collections comprise over 92,000 objects, ranging from ancient to contemporary art, including Greek and Roman antiquities; medieval and early Renaissance paintings, sculpture, metalwork, and stained glass; over 10,000 prints and drawings; and 20th-century and contemporary paintings, prints, sculpture and photography. John B. Putnam Jr. Memorial Collection of outdoor sculptures includes works by Alexander Calder, Henry Moore, Louise Nevelson, Isamu Noguchi, David Smith, and Tony Smith. Ellarslie Mansion built in 1848, residence and 80-acre estate acquired 1888 by City of Trenton for $50,000 to become Cadwalader Park, its first public park, designed by Frederick Law Olmsted, architect of Manhattan's Central Park. Collection features ceramics and tableware of Trenton's prominent pottery makers, including Lenox, Stangl, Fulper and Boehm. Other holdings include fine arts, decorative arts, industrial memorabilia and historical objects. Also includes period Victorian room representing an Ellarslie parlor as it may have looked as private residence in 1860s. Hosts changing exhibitions of contemporary art in all media; special events, musical programs, and art classes; and annual juried exhibition--Ellarslie Open--of regional artistic talent primarily from New York, New Jersey and Pennsylvania. 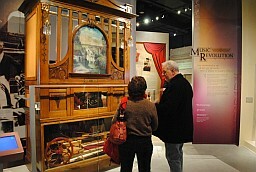 Operated by nonprofit Trenton Museum Society. 42-acre sculpture park located on site of former New Jersey State Fairgrounds near Trenton, opened to public in 1992. Founded by sculptor and Johnson & Johnson heir J. Seward Johnson, Jr., with goal of making contemporary sculpture more widely accessible to public. Sculptures displayed on extensive park grounds and indoor museum, over 270 works have included those by Clement Meadmore, Anthony Caro, Beverly Pepper, Kiki Smith, George Segal and Johnson himself. Some works commissioned specifically for park, such as Magdalena Abakanowicz’s Space of Stone and New Jersey artist Isaac Witkin’s Garden State. Early financing largely from private foundations funded by or associated with Seward Johnson, now operated by public not-for-profit corporation. On-site restaurant Rats﻿﻿﻿﻿,﻿ named for character "Ratty" in The Wind in the Willows--Seward Johnson's favorite childhood story book--styled on theme of fairy tale and Monet's impressionist art. Located in Evens House built 1785 by Thomas and Mary Evens, later owners developed golf course on property. House and course acquired by Marlton Township in 1990s, now Indian Springs Golf Course. Features rotating exhibitions of local artists, sponsors annual watercolor competition for regional artists. Sponsors variety of contemporary and historical art exhibitions and related programming under direction of University's Visual Arts Program. Exhibitions include works in painting, drawing, photography and film by nationally recognized artists as well as regional, local and student artists. Gallery open only during scheduled exhibits and during University calendar. Founded as Wheaton Village in 1968 by Wheaton family, principals of Wheaton Glass Co. established in 19th century. Museum of American Glass houses most comprehensive collection of glass produced in America, with special focus on preservation of Mid-Atlantic glass industry, especially New Jersey glass tradition through collection of objects, tools, equipment, company records, photos and ephemera.. Center features demonstrations of glass blowing and other crafts, sponsors exhibitions, education initiatives, residencies and other opportunities for artists. "Down Jersey Folklife Program" supports research, documentation and presentations of traditional cultures in New Jersey’s southern eight counties. Located on 65 wooded acres in Millville, site hosts Museum of American Glass, Creative Glass Center of America International Fellowship Program, a hot glass studio, several traditional craft studios, five museum stores, event center and pond-side picnic grove. Exhibition program includes national and international touring exhibitions as well as exhibitions curated in-house and by local curators supplemented with talks and demonstrations by artists, lectures by scholars. Permanent collection of over 450 works by such artists as Jennifer Bartlett, Salvador Dali, Helen Frankenthaler, Leon Golub, Yvonne Jacquette, Marisol, Robert Rauschenberg, Larry Rivers, and Victor Vasarely. Areas of concentration include works on/of paper by contemporary artists and works by artists living and/or working in southern New Jersey. Center also includes performance and community arts education programs at Gordon Theater and Black Box Studio. Located on campus of Rutgers-Camden. Opened in 1983, announced indefinite closing effective January 2016 of main building on Stockton University Campus in Galloway Township, but continues to operate branches with exhibits in Atlantic City and at Seaview Resort in Absecon. Founded by local entrepreneurs and collectors Fred and Ethel Noyes, with Fred an artist who produced many works of southern New Jersey's natural features and collected vintage duck decoys. Other holdings include art, folk art and crafts from 19th to 21st century.